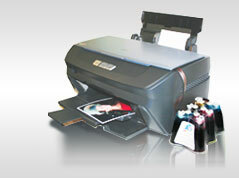 INKSYSTEM provides different kinds of advertising support to partners in regions. 1. Advertising by the site. Confidently taking 1-3 places by key inquiries (CISS, СISS City, CISS Epson...) in the majority of the CIS countries, the site involves about 1000 visitors in day, many of them find goods they need, then find representation contacts in their city and purchase. In other words, the client with our help searches for you, not you. The photo of any kind of advertising production will be sent on demand. All materials are provided for FREE. 3. Mail advertising - we suggest potential customers visit you and make purchase (with phones of concrete representations in regions!) by e-mail and usual mail. 4. Marketing training. "Marketing" is one of the main parts of the educational course. In this part we tell about successful and not successful (!) experiences of promotion from representations in the regions. We analyze advertising efficiency of СISS by different communication channels, recommendations about advertising in the region. 5. Participation in advertising campaigns in your region. It’s possible that our company will incur a part of expenses on the advertising campaign in your city (after it coordination). 6. Exhibitions. Annually we participate in 5 - 8 international and national exhibitions in which we communicate with thousand people from different corners of the country. In particular, on exhibition (09-12th of April) in Moscow ("Photoforum 2009") to our stand came more than 4000 persons daily. 7. Other kinds of advertising: banners, ads on advertising boards, Yandex Direct, Begun, and other kinds of advertising support will allow you not have lack of clients and if you work too, your profit will be more.